If I’m being totally honest, Ryan Villopoto flat out scared me when I started covering the sport from the journalist side of things back in 2011. I’m originally from Southern California, but I’ve lived in the Pacific Northwest since 1994, so I watched RV coming up from way back when he was on 65s. I would say part of that fear of talking to RV was the fan in me, but the bigger part was that he was the toughest interview for me in the paddock. When I did get to interview RV, he always gave me the short, four-word answers and he was always so serious and guarded that it was tough for me to ever get an interview that showed his personality. So when I see RV just hanging out with fans at the track, winning 125 races and hitting the beer bong on the podium afterwards, I get as excited as every other fan out there. 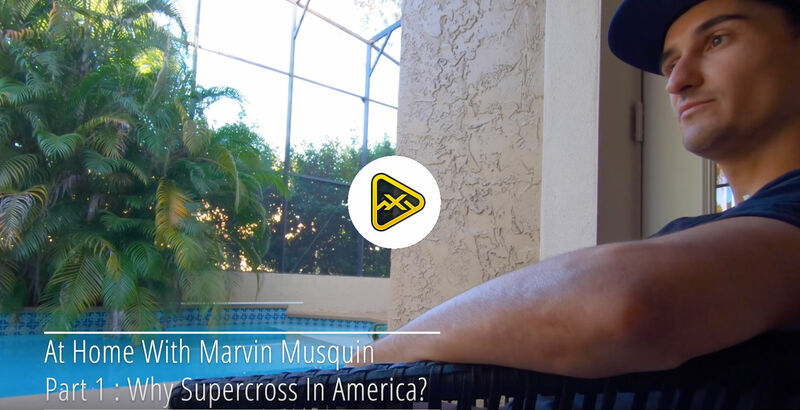 After seeing RV win the 125 All-Star race ahead of Mike Brown and Wil Hahn and celebrating the win by accepting a beer bong hit from a guy dressed up like an eagle on the podium, we thought we would go talk to the nine-time AMA national champ. Ryan, you look like you’re doing more press now than when you were racing? I do a fair amount. I do a little bit of it. How did you like Washougal today? I know you grew up in Washington state, but it was pretty far away from here. I think you told me before you didn’t actually race here that much growing up. 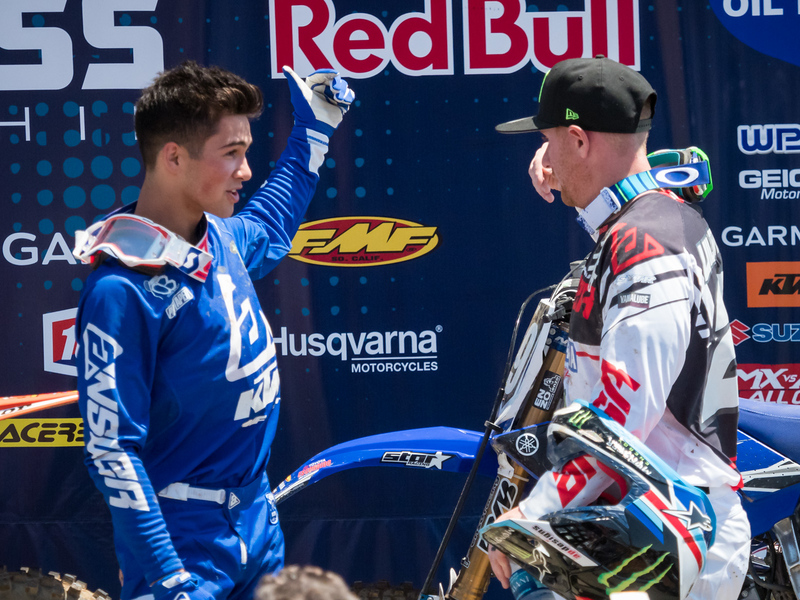 At Hangtown, you had a 16 year-old take it to you, and here today you had an old man in Mike Brown–46 years-old–trying to beat you and getting close to doing that. Talk about two extreme different sides of the coin. Man, Brownie was on the gas. On the podium I was like, “Dude, any more laps than that and I would have been too tired to go that speed.” He goes, “I know; these things are hard to ride.” We’re all used to four stokes now. He probably rides a lot more than you do now too? I think Brownie rides a lot, yeah. 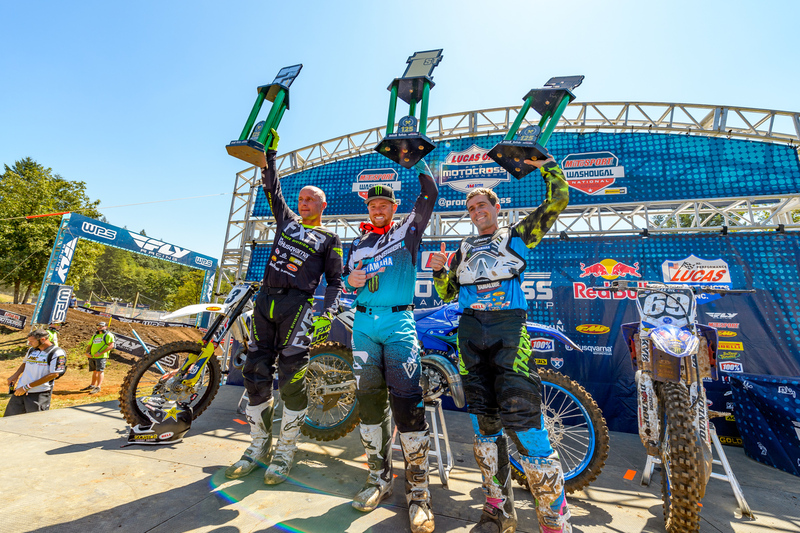 Alright, things have definitely changed in the Ryan Villopoto program. 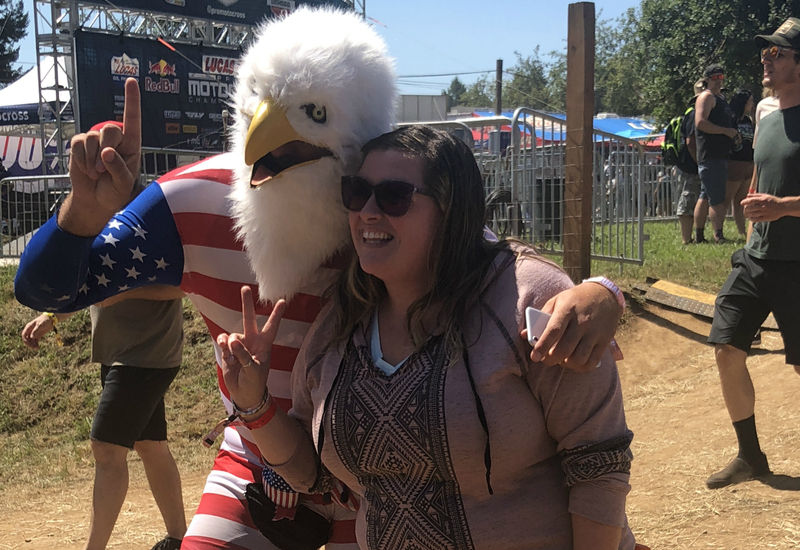 I go to the podium to get some photos and I get a shot of you taking a beer bong to the head from a guy dressed like the American Eagle. Yeah, the eagle has landed! (laughs) It’s cool, you know. Doing it as many years as I did it and as serious as I always was when doing it, it took the fun out of it. So now it’s like I try to do cool things and just have a lot of fun with it–just hang out and try to step out of the box a little bit. Maybe bounce off the guard rails is a better way of looking at it. For sure, but if you want to win, it’s hard to do that. I think ultimately it makes my value go up. Fans want to see that. They want to be able to hang out with someone that’s normal and having fun. I don’t do that all the time, but the eagle was there. He passed it off so I couldn’t turn it down. This is eagle that just happened to be carrying around a beer bong and cold beers for RV at Washougal. We hope to see him again at MXoN. I talked to the eagle earlier and he said he didn’t think he was going to the MXoN. I’m quite disapointed to hear that. Ah, I don’t know. He said he might go. Oh, so now it’s a might? (laughs) How much riding are you doing these days? In a month, I’ll maybe do six times a month. If it gets really heavy, I’ll maybe do three days a week for a month. A fair amount, but not a ton. Last time I talked to you was at Anaheim 1 and you were talking about bringing back the PacWest series up here in the Pacific Northwest and about you doing some of the promoting. How did that go for you? The PacWest was good. I think for a start up series it was great. We’re going to build on it. MotoSport.com is a major sponsor behind it, so Darren [Green] and those guys have been awesome. They’re all in on it for next year. We’re going to try to give back to the racers that show up. We’re going to hopefully give them a ton of products they can’t get from anywhere else and awards. How it’s set up is every track runs their own race. Washougal even had a PacWest race. It was combined with one of their other races because the other one rained out. So every track runs their own race and keeps their own revenue, but $5 comes back to me and I can turnaround and buy product at a better deal than even a shop can get it at. I try to do that anyways, and I give it all back to the riders.